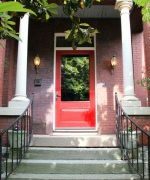 After a recent break-in at their Old Louisville home, these homeowners needed to upgrade and revitalize their entry door. The original door, with undersized deadbolt lock and inoperable knob lock, was no match for the intruders. 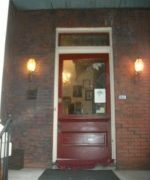 The door, jamb and trim were damaged beyond repair so approval was granted by the Louisville Landmark Commission for a replacement door. The commission was established to protect and preserve the distinctive character and historic value of structures in preservation districts and the homeowners were required to use a replacement door that “duplicates the design, proportion, and arrangement of paneling and glazing of the original door”. Problems existed even before the break-in. 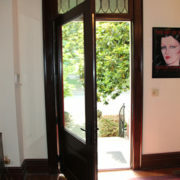 Settling of the house combined with warping and bowing of the original wood door required the homeowners to attempt to reduce cold weather drafts by placing a rolled rug at the base of the door. The lack of a true threshold combined with an improperly aligned door sweep on the bottom of the door caused damage to the wood floor finish. The homeowners needed a solution to these problems along with improving their security. 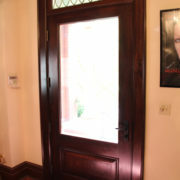 The homeowners selected an IWP solid Mahogany wood door. Custom stain was blended to match the stained wood trim in the interior of the home and to maintain the historic integrity of the home’s design. The Door Store and Windows installation team worked to retain the original overhead transom by carefully working around it during the removal of the old door and installation of the new door. All of the work, including exterior trim replacement, was performed without ever removing the original transom. The new Mahogany door is a near replica of the original door and conforms to the Landmarks Commission design guidelines. Security was beefed up with an oil-rubbed bronze lockset featuring a multipoint locking system.